Turkish shipyard Esenyacht has announced that it has commissioned Mannerfelt Design Team (MDT) of Sweden to develop a 50-metre composite motor yacht, and Esenyacht's General Manager Deniz Can confirmed in a phone call to Boat International that the yacht will be built. 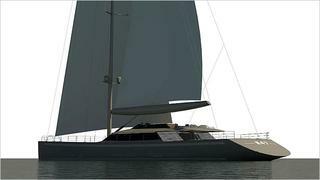 Esenyacht is currently near the completion of the build of its sloop-rigged 47-metre sailing yacht Troy, pictured above, which is due to launch in early 2015. 'As soon as Troy finishes, we are working on this new project,' Can says. 'We will probably start construction in first half of next year.' Esenyacht will embark on the build of the 50-metre motor yacht on spec, but it will present the new design at this year's Monaco Yacht Show as a new concept to entice the right owner. 'Of course we are looking for a client,' Can continues, 'but we've already started making the investments to build this boat. The design process is finished, and now the engineering process has begun. Notably, this is the first motor yacht for Esenyacht, who are known for delivering sailing yachts like the modern gulet sailing yacht Glorious, pictured above. Swedish design team MDT, helmed by Ted Mannerfelt, was selected for its experience in designing prize-winning powerboats. The 50 metre superyacht design combines modern styling and luxury with strong performance. The design includes an efficient hull, advanced propulsion and a lightweight interior. The use of carbon fibre will result in a fuel-efficient yacht with low carbon emissions. The design will be characterised by large windows and big, open spaces. The exterior styling will reflect advanced technology with a sleek, low, efficient profile inspired by my time as a car designer for Jaguar cars,' says Ted Mannerfelt of MDT.